If you read my previous post you would've seen that I received both my Bellabox & Lust Have It for March 2013 on the same day & I wanted to post about each box separately so this is the post for my Lust Have It box this month. 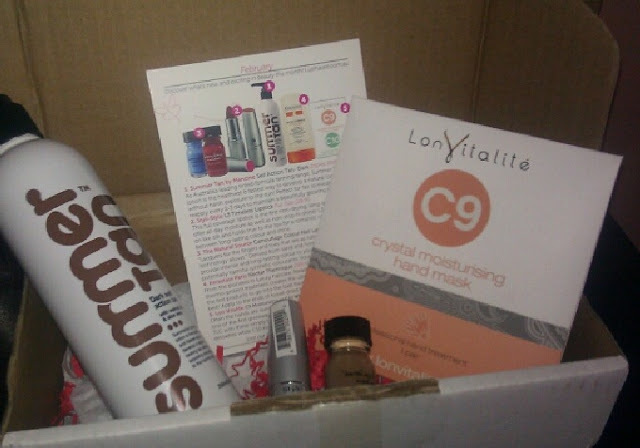 I wasn't to impressed by this box nothing really stood out to me but I did try as many products as I could. There were only 4 products in the box which was disappointing (there was meant to be a 5th but they sent it out with the march box due to weight management issues) there was also not Collective Box which I have been looking forward to. I loved the Summer Tan Self Tanning product these are kinds of products I tend to use as the colder weather kicks in as for some reason my legs go insanely pale while my arms stay relatively tan so I've been using this to keep my legs even to my arms. I also have used & love the Lon Vitalite Hand Mask its unlike anything I've ever used before & I will be doing a Full Review on it soon. What did you get in you March Lust Have It Box? The Bellabox seems quite good! I dont know if you have done the liebester award before but i have mentioned your blog in a recent post if you want to check it out! Dont have to do it if you have already or dont want to! Hm a decent box I think! :) The camouflage crayons look nice.